Seriously, I've lived here for 20 years and Marianne and I agree that the greater Boise area (what locals call "the Treasure Valley") is a fantastic place to be. We both raised our kids in the Treasure Valley and really feel like it was the perfect place to do so; small population, lots to do, and great weather. Combine these attributes with being geographically isolated ("Boise...? Somewhere between Salt Lake City and Portland, I think?") and you have one great location. So whether your final destination is Boise, Idaho or if you're just passing through on your way to the Great Pacific Northwest, we're glad that you stopped here. Check out our recommendations for Good Eats, campgrounds, and our favorite things to do. Table rock is a large, sandstone plateau overlooking the Treasure Valley. 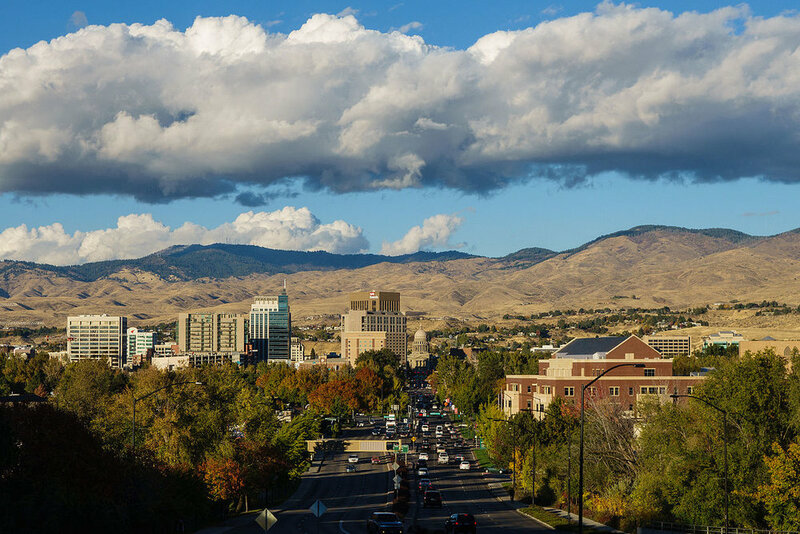 Laid down by an ancient inland ocean, Table Rock has been quarried in modern times to build many of Boise's most historic homes and buildings. Today active mining continues but several hiking and biking trails access the area and a good road is open for public access between dawn and dusk daily (you WILL get locked in if you do not leave at dusk). Unfortunately there is no camping on Table Rock and the road is unsuitable for travel trailers and RVs. However, if you can unhook or you have a tow-along, visiting Table Rock is a fun trip with amazing views of the city and the entire Snake River Valley including three mountain ranges; the Wallowa-Whitman mountains to the west, the Boise Front to the north, and the Owyhee Mountains to the south. To get there, take Old Penitentiary Road in southeast Boise (off of Warm Spring Blvd.) to the Old Idaho Penitentiary Site and park there. The Old Pen as it’s known and the Warden’s House are built from Table Rock sandstone. A couple hiking trails lead up to Table Rock in about two miles. If you’d prefer to drive there, from Fort Boise Park take Reserve Street up into the foothills to Shaw Mountain Road. From SMR take E. Table Rock Road up through some fancy homes and to the gravel turnoff for Table Rock (on your right as you head up). E. Table Rock Road dead-ends at a gated ranch so you won’t be able to go too far. The road becomes gravel at this point and is normally very bumpy; about a mile of this until you reach your destination.